The vast majority of premature deaths can be prevented through simple changes in diet and lifestyle. In How Not to Die, Dr. Michael Greger, the internationally-renowned nutrition expert, physician, and founder of NutritionFacts.org, examines the fifteen top causes of premature death in America-heart disease, various cancers, diabetes, Parkinson's, high blood pressure, and more—and explains how nutritional and lifestyle interventions can sometimes trump prescription pills and other pharmaceutical and surgical approaches, freeing us to live healthier lives. History of prostate cancer in your family? Put down that glass of milk and add flaxseed to your diet whenever you can. Have high blood pressure? Hibiscus tea can work better than a leading hypertensive drug—and without the side effects. Fighting off liver disease? Drinking coffee can reduce liver inflammation. Battling breast cancer? Consuming soy is associated with prolonged survival. Worried about heart disease (the number 1 killer in the United States)? Switch to a whole-food, plant-based diet, which has been repeatedly shown not just to prevent the disease but often stop it in its tracks. 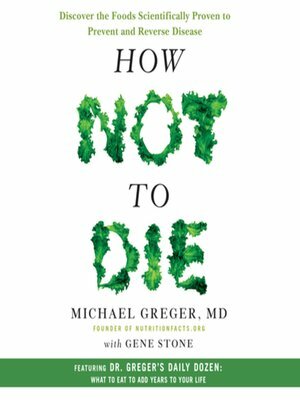 In addition to showing what to eat to help treat the top fifteen causes of death, How Not to Die includes Dr. Greger's Daily Dozen—a checklist of the twelve foods we should consume every day. Full of practical, actionable advice and surprising, cutting edge nutritional science, these doctor's orders are just what we need to live longer, healthier lives.